Rio Tinto and China Baowu Group have entered into discussions for extending the Bao-HI iron ore joint venture in Western Australia’s Pilbara region. The joint venture, which pertains to the Eastern Ranges mine and Western Range project in the Pilbara, has achieved sales of more than 180 million tonnes since it was created in 2002. Rio Tinto said a heads of agreement was signed at a ceremony in Shanghai which reinforces the company’s partnership with Baowu, recognising the significant expertise and knowledge both parties bring to the joint venture. 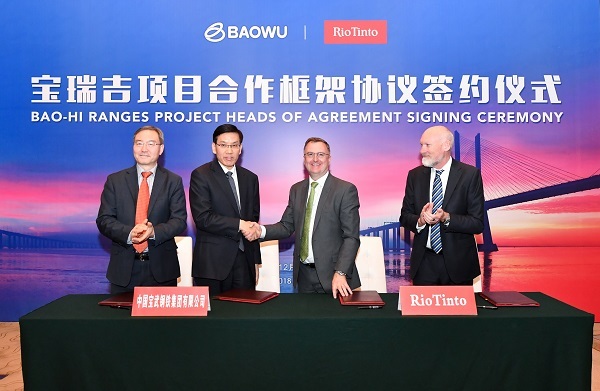 “The signing of this agreement is a significant milestone in the partnership between Rio Tinto and Baowu that extends back more than four decades and was enhanced with the creation of the Bao-HI JV,” said Rio Tinto Iron Ore chief executive Chris Salisbury. Rio Tinto, which owns 54% of the Bao-HI JV, has already commenced a pre-feasibility study in to the Western Range project which is expected to be completed by the end of 2019.